The art that I truly and enduringly love, the art that never loses its fascination for me, tends to be the art that captures me the very first time I see it. Bruegel is a perfect example of this. I first encountered his wonderful work in the kitchen of a friend’s house. One wall of her kitchen was wallpapered, so to speak, with postcard-sized reproductions of famous works of art, and one of those works of art was Pieter Bruegel the Elder’s Hunters in the Snow (or Winter, as it’s properly titled). It was love at first sight. I walked right into the picture behind those hunters, and I’ve adored the painting ever since. At the time, I didn’t even know who had painted the picture. I think that, on this kitchen wall, the painting was called “The Return of the Hunting Party” or something like that, and I don’t recall that the name of the artist was given. I don’t remember ever asking my friend if she knew anything about the picture; I just examined it quietly each time I was at her house, and at some point I managed to put painting and artist together, and that was that. What fascinated me initially about Hunters in the Snow is that it made me feel cold just looking at it. Looking at this painting is like standing in an open doorway and looking out at a wintery landscape. You can see your breath when you look at the painting, you can feel the bitter chill on your cheeks. The colors are harsh - black, white, blue-grey - the colors of a world that has not seen warmth or sunlight for a very long time. The sky is as flat and unforgiving as the sheets of ice covering the rivers and lakes in the valley. The trees, spidery and bare, jut lifelessly from the frozen ground, and the wiry brown tendrils of the plant in the foreground are being smothered by snow. The perspective of the painting invites you to walk into that wintery world, even though that world is more harsh than inviting. The trees on the left side of the painting march in a straight line down the hill, and the hunters and their dogs follow. You are made to feel as if you are a part of the hunting party, as if you, too, will soon reach the crest of the hill and then begin your descent into the cozy valley below. It’s this trick of perspective that startles me and draws me in every time I look at the painting. You can hear the hunters crunching through the deep snow, their breathing ragged from the exertion in the freezing air. You can hear the hunting dogs panting, the distant laughter and shouts of the children cavorting on the ice of the lake, and the occasional mournful cry of the black birds circling overhead. You can even hear the fire crackling in front of the tavern to the left, and you can smell the woody smoke on the winter air. The colors of the paint have undoubtedly changed and darkened over the course of the centuries (Hunters in the Snow was painted in 1565), but that’s done the painting no harm from an aesthetic point of view. Bruegel was able to perfectly capture the light, the feel, the atmosphere of a late winter afternoon in the countryside. Exactly what countryside it’s meant to be is a mystery - there certainly aren’t any mountains like that in Holland. But Pieter Bruegel did take a long trip to Italy, so he was certainly familiar with mountains. And anyway, exact locations don’t matter. The painting Winter is the archetype of winter, the Idea of winter. It can be any winter you want it to be, anywhere you think it should be. The fact that the painting is unconstrained by an exact location is part of what gives the work its enduring quality. I think that Hunters in the Snow is more constrained by a sense of time than of place. Despite the fact that the year 1565 is not really the Middle Ages anymore, Hunters in the Snow perfectly captures my concept of what the Middle Ages was like: cold, brutal, fairly miserable, and real. Perhaps it’s that aspect of Bruegel’s paintings that intrigues me most of all: his subjects are so detailed and so realistically portrayed that they seem to be able to march right off of the canvas and into our world. 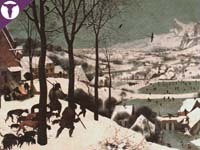 The hunters may have apocryphally given their name to the Bruegel’s painting Winter, but they are not the real focus of the painting, or the only focus. The focus is on winter itself, and they are but one detail amongst numerous others that bring Bruegel’s painting to life. The longer you look at Hunters in the Snow, the more there is to see. There are tiny villages, churches and towers scattered throughout the valley. The houses have tiny windows, tiny smoking chimneys, tiny icicles dangling from the rooftops. There are little horses and wagons, miniature bridges, microscopic barrels lined up in front of buildings. But the most miraculous thing of all is that there are people everywhere - people so small that you can only get a good look at them if you see enlarged details of the painting. It’s worth it to look closely, because every tiny person is different. The frozen lake is covered with ice skaters. There are couples skating together holding hands, and there are children playing with wooden toys or chasing each other across the ice. There is a mother with a child, there are boys with a sled, there are skaters skating elegantly on their own and there are some who have fallen flat on their faces (Bruegel had a sense of humor). There are people sitting at the edge of the lake putting their ice skates on, and there are others who are just watching. Apart from the skaters, there are people working: a woman carries a bundle of bare branches, a man drives horses along a road, a group of people climb up ladders to reach a chimney that appears to have flames blazing out of it - and on and on and on, the little figures continue into the distance until they are no more than dark specks, and it is impossible to see what they are doing - but you can be sure that they’re doing something. I was lucky enough to be able to see an exhibition of the Bruegel family’s “greatest hits” in Vienna several years ago. It was a huge exhibition of the paintings of Pieter Bruegel the Elder, Pieter Bruegel the Younger (who, amongst other things, did a remarkable job of copying his father’s greatest works), and Jan Bruegel (who, amongst other things, painted gorgeous, velvety flowers). I had to wait in line for quite a while before I got into the exhibition, and as I stood outside I could see Hunters in the Snow from a distance. It was absolute torture; I was literally jumping and squirming, I was so anxious to get in there and get my first real-life look at my favorite painting in the world. It was the first painting you saw when you walked into the main room, and I made a beeline for it and stood there for a very long time in utter awe. I would have given anything to be able to touch the paint. The other paintings were brilliant as well - The Tower of Babel was breathtaking - but it was Hunters in the Snow that I kept going back to, and Hunters in the Snow was the last thing I saw as, after hours of being immersed in the art of the Bruegels, I left the exhibition and looked back through the doorway one last time. I will never, ever cease to be amazed at the depth and detail of Hunters in the Snow. I could probably say that about every Bruegel painting I have ever seen, whether I have seen it in a museum or in a book. Bruegel’s paintings are sometimes like photographs, accurately and objectively capturing the people and things that populated his world and his imagination. He portrays his world with a real sense of affection and without condescension. As harsh as their lives may have been, his subjects appear to be hard-working, endearing people with a great potential for joy and fun. Bruegel has managed to make his world almost as real to me as my own world is. And each time I crunch along the frozen ground in the blue light of a late winter afternoon, I see my breath on the chill air, I can smell the smoky fire and I feel like I’ve walked into Bruegel’s winter wonderland. Have you seen the Russian film ‘Solaris’? By Tarkovsky I think, from the book by Stanislav Lem. In the middle of it there’s a visual meditation on Hunters in the Snow - you really should have a look. It’s set to a Bach piece, called ‘Ich Ruf Zu Dir’ I think (sorry, German’s not my strong point). It works very well in a what-was-that-all-about fashion. I enjoyed reading your essay. It’s one of a small group of pictures I’d love to see in the flesh - I strongly identified with your description of what it’s like to go into a room in a gallery knowing you’re walking towards a treasured work (for me, one eg. being the Arnolfini Marriage at the London National Gallery). I haven’t ever seen “Solaris”, but it’s one of those films that has been on my “Must See Eventually” list for quite a while - and it’s moved a lot higher up in that list since you told me about the Hunters in the Snow bit! Apparently an English-language version of the film is going to be made in the near future - I’ll have to be sure to see the original first (and read the book). I loved your comments on Bruegel’s “Hunting in the Snow”. I came upon his works trying to track down a painting I used to possess alas no more its in Canada and I’m in the UK. I am convinced that it was a print of Bruegell unless someone painted in exactly the same style. It is obviously set in a european village back in the 16 century and shows children and villagers skating on the village pond.Again the detail is amazing but here the figures are closer and the details of village life is exquizate.Yes Bruegel did paint a picture entitled Skaters but its not the same one. I am longing to find out who painted the print I had and be able to replace it. My print was quite large about 2ft 6ins by 18 ins again much bigger than Bruegels paintings so its possibly by a different artist.The houses in tje pictures lookedtaller than those featured in Bruegels painting being of several stories in height.i am unable to pin-point them to a country but definately the scenes, dress etc looked circa 16th century. I wonder if my description of my print may help u to identify the painter as u are far more experienced than I in such matters or maybe one of ur readers might have some idea. The print I had was obviously mass produced and framed in a gold ornate plaster moulding. I welcome any feedback to these comments. I am doing this artist for a school project. Since my professor is expecting a forty page essay on an artist of your choice, I decided to set out for an "unknown" in our class. Alas, I came upon this article. It really sent shivers down my spine. Have you considered a writing class of any sort? You should definitely look into it. I know that UCLA has a great class called Understanding Art. I bet you would enjoy it immensely. Thanks for reading this if you did!!!!!! Hey it is me again and I want to say how much I also want to view this painting in person. Has anyone seen it??? I would greatly appreciate if you would post what it was like if you did. Thanks. I also think this painting is absolutely marvellous and I never tire of looking at it. You are very lucky to have seen the original but even the smallest reproduction impresses. Could this be the greatest work of art ever? I love the composition,the details and the feeling that we are in a complete world. Besides the obvious literal interpretation it also hides a spiritual message of mankind’s search for the eternal.To me this painting is on a par with a Beethoven symphony.It is nice to Know many people are affected by this work.As I look out of my window on a cold January morning I can see a Brueghal world out there. I have just discovered this wonderful commentary on Breughel’s "Hunters in the Snow," and so I include my poem "The Chimney Fire," which is partly derived from this remarkable painting. Please excuse the length. how slow his footsteps! —though he is doing all he can with the brief strokes he was given. (or beginning) as dawn pried open shows the day done for, a cooked hare. where a fire’s temper swiftly crazes the air’s dry stir. sprung from glacial hills, punish these determined lives, menace the rescue? human and mountain, pushed upward by expressive need, is riddled with fractures. as the cracks in a burning log fill with eager heat hastening to break forth. how many branches, stark or fervently leaved, have sprung on pollarded trunks? and the hairs on his head rise like young stalks or birds tuned to advancing light. I, too, am moved by Pieter Brueghel the Elder’s painting of "Winter." I cannot even give words to what it makes me feel. I know that I love it and that I never tire of looking at it. I am drawn into it and it feels so huge and so intimate at the same time. Seventeen years ago I fled Europe for the warmer shores of Australia, partly for the weather. This painting makes me yearn for the things I thought I hate. Winter is a harsh season, but it is also a beautiful one. And people have adapted to it, as Breughel’s painting shows. Sleds becoming transport, ice skaters enjoying themselves on frozen lakes — those are memories of a former life I now hold in fond memory. Thanks for sharing your thoughts on Bruegel’s painting! Tarkovsky’s film “Solaris” brought me here: as others have already mentioned, the paiting is featured quite prominently in one of the key scenes there. The film is not straightforward to understand in its entirety – there are many images, symbols, and actions that allow for interpretation, so it’s helpful to search the web for ideas and suggestions. The painting has no immediate connection to the story of the film (it’s just a replica hanging on the wall of the library aboard the Solaris space station), but it gets one or two full minutes of screen time, which is a lot. The film aside, there is one interesting detail in the painting that commenters on other sites have mentioned: the hunters are returning to their village, but they haven’t actually caught anything except one small animal, presumably a fox. This is a fairly poor result for three people and a pack of dogs, who have probably spent the entire day hunting. This matches well with your idea of hard-working people who, still, have a rather miserable life under harsh conditions. I hope you’ve had a chance to watch the film in the meantime!